The unique healthy alternative to sleeping pills - the GLO to SLEEP™ mask - which changes disruptive Beta brain waves to calming Alpha waves will be given to celebrity attendees of the American Kidney Foundation of Southern California auction in Los Angeles on May 18, 2008. Today, glotosleep.us announced that they are to donate their flagship product, the GLO to SLEEP™ mask to the celebrities attending the May 18, American Kidney Foundation of Southern California's 29th Annual Gift of Life Tribute Celebration Honoring Dr. Phillip Tuso, LaTanya Richardson and Samuel L. Jackson at the Century Plaza Hotel, Los Angeles, California. "We are very pleased to have been asked to support this worthwhile health and awareness cause, because the GLO to SLEEP™ mask is one of the healthiest alternatives available to sleeping pills," said Peter Mackeonis, a spokesperson for the company, continuing, "Tens of millions of people a year take sleeping pills, and, as anyone who takes them as a cure for insomnia knows, they often cause more problems than they solve," citing next-day dizziness, forgetfulness, headaches and sleep-driving and sleep-eating as the main issues. The GLO to SLEEP™ is a unique sleeping tool, as it has no side-effects and enables the wearer to fall asleep without the use of any electronics or pills. As the wearer focuses on a number of inert photoluminescent dots strategically placed just above eye level, the body's own sleep system stimulates the pineal gland to release natural melatonin, converting troublesome active beta brainwaves into calming alpha waves. All disruptive thoughts and worries about work, finances and relationships dissipate until morning. GLO to SLEEP™ masks are made in the U.S. from soft, breathable, hypoallergenic foam held in place by an adjustable soft Velcro® strap, and as the recessed foam is a total black out mask, they are ideal for the newly popular, afternoon office nap. This is not the first celebrity involvement for the GLO to SLEEP™ mask, as these natural sleep aids were included in the 2008 Oscars(R) "Everyone Wins at the Oscars® "Goodie Bags." Glotosleep.us believes that "many people might still be alive today - including some of the world's most popular entertainers, such as Jimi Hendrix and Marilyn Monroe, and more recently Heath Ledger - had they been given a safer alternative to sleeping pills," said Mackeonis. Santa Cruz Holistics, the U.S. Distributor of the GLO to SLEEP™ mask, is a Triple Net company, caring as much about their societal bottom line as they do their financial bottom line. They distribute the GLO to SLEEP™ mask not only out of concern for the social side-effects of the mountain of sleeping pills taken every year, but also because of their environmental impact. The use of sleeping pills also translates into huge amounts of packaging and paperwork being dumped into landfills every day, as well as chemical residues being 'flushed' into the water table through human waste. And, because the masks are made in the U.S., they are fair trade products that protect American jobs and wages, and all the materials used are hypoallergenic, including the adhesive. 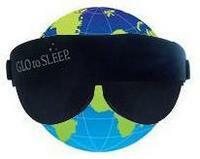 During the month of May, to celebrate Mental Health month, GLO to SLEEP™ masks are available at the glotosleep.us online store for the reduced price of $59.95 with free shipping (The recommended price for masks is $69.95).